Move oven rack to low position so that tops of pans will be in center of oven. Heat oven to 350°F. Grease bottoms only of 2 loaf pans, 8 1/2x4 1/2x2 1/2 inches, or 1 loaf pan, 9x5x3 inches, with shortening. Mix all Praline Topping ingredients until crumbly; set aside. In large bowl, mix granulated sugar, oil, vanilla, eggs and pumpkin. Stir in remaining Date Bread ingredients except dates until well blended. Stir in dates. Pour batter into pans. Sprinkle with topping. Bake 8-inch loaves 50 to 60 minutes, 9-inch loaf 1 hour 10 minutes to 1 hour 20 minutes, or until toothpick inserted in center comes out clean. Cool 10 minutes. Loosen sides of loaves from pans; remove from pans to wire rack. Cool completely, about 1 hour, before slicing. You can wrap the baked bread tightly and store at room temperature up to 4 days or refrigerate up to 10 days. 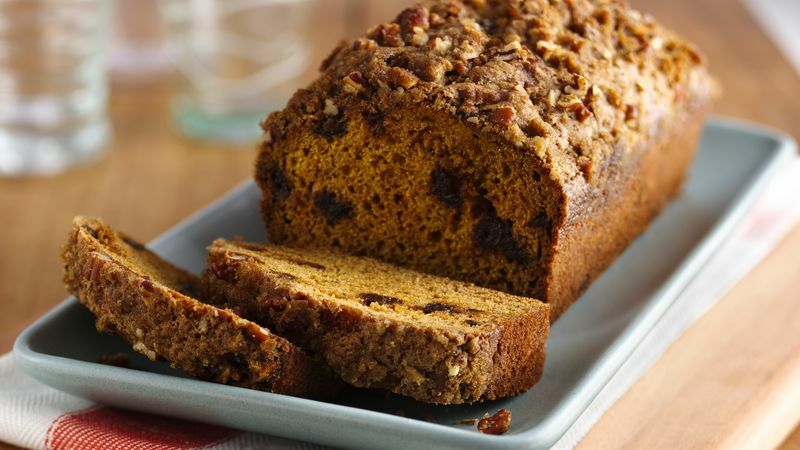 This sweet and spicy bread is perfect for gift-giving. Wrap cooled bread in clear or colored cellophane and tie with ribbon, raffia or beaded string.